My husband Ray and I were talking last night and he forced encouraged me to work on my blog and WRITE. He said some of the things I’ve been sharing on my blog are terrible just online events and they can be posted on Craigslist for sale Facebook. You may be sighing with relief now and thinking, “Thank God, SOMEONE told her! I am SICK of hearing about her next Talkshoe show! I want to read a real BLOG!” Ray won. Today’s blog is about my new smart phone – and it WILL have a good point. I have changed since I married Ray and one of those ways is in the gifts I want Ray to buy me for Christmas, Valentine’s Day, Easter, my birthday, St. Patrick’s Day, Groundhog day, Talk Like a Pirate Day….just kidding. Now instead of requesting a cute stuffed bear or a marquise diamond ring, I ask for geeky gadgets: a purple Ipod, a laptop, or as I did for today’s birthday, an upgrade to my cell phone. Of course, if Ray comes home bearing gifts like the chocolate peanut M & M’s that he brought in the other night, I’m NOT going to turn up my nose! 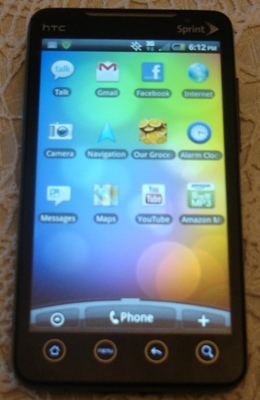 For my birthday (which is today – leave happy birthday comments below, lol), Ray got me the Evo 4G smart phone. I wanted an Iphone because my friends have RAVED about how great it is. In order to get an Iphone, we would’ve had to switch carriers, get a 2-year contract, put down deposits, and had to pay $199 each for our Iphones. Uh…no! I’m still learning HOW it works. Thank you God for my teen child Leah. This generation seems to just GET technology. Yesterday Ray and I weren’t able to transfer the data on my old phone to the new one, but Ray showed me how to sync my laptop and phone. For all non-teens, sync means same…I transferred what’s on my laptop to my phone, including Microsoft Contacts. I didn’t have to peck away all day on the phone’s keyboard every family member’s, friend’s, or business associate’s name, phone number, email address, etc. The syncing was done within 10 minutes through a USB cable. The “sync” process made me think of our relationship with God. Are we in sync with God, with His word? The definition of sync is: to synchronize, to happen at the same time, to make happen at the same time and speed. In other words, harmony and agreement. Walking and talking with Him, as Enoch did until he was no more. (Genesis 5: 24) Not running ahead of Him and His timing, or lagging behind and missing His will. Are you in agreement with God? Or do you just want Him to be in agreement with you and your plans? Want to learn more about walking with God each day? Just click here. Wow, that was powerful, Beth. Are we synchronized with God? I like that. Arrrrhhhhgggg! I can’t believe I forgot to buy you a gift for “Talk Like a Pirate Day!” No wonder you have been moody.